Description	 MS in Swedish on paper, Stockholm, 1945-1948, 1 p., 21x16 cm, single column, (ca. 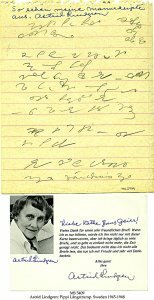 19x14 cm), 12 lines in shorthand, 2 lines dedication in cursive script, autograph, signed, with a typed signed letter and signed photo. Binding	 London, quarter morocco slipcase gilt, by Chelsea bindery. Context	 Astrid Lindgren's original MSS in Kungliga Biblioteket in Stockholm were placed on UNESCO's World Heritage list in 2005. Provenance	 1. Astrid Lindgren, Stockholm (1945-); 2. Kathe Jans Geier, Germany (ca. 1950? ); 3. A. Schmolt, Krefeld, Germany (-2001); 4. Per-Otto Løvstad, Oslo (2001-2007); 5. J.W. Cappelen bokauksjon 48, 14.5.2008: 214. Commentary	 Astrid Lindgren (1907-2002) Sweden's greatest writer of children's books, sold about 145 million copies in more than 100 countries. 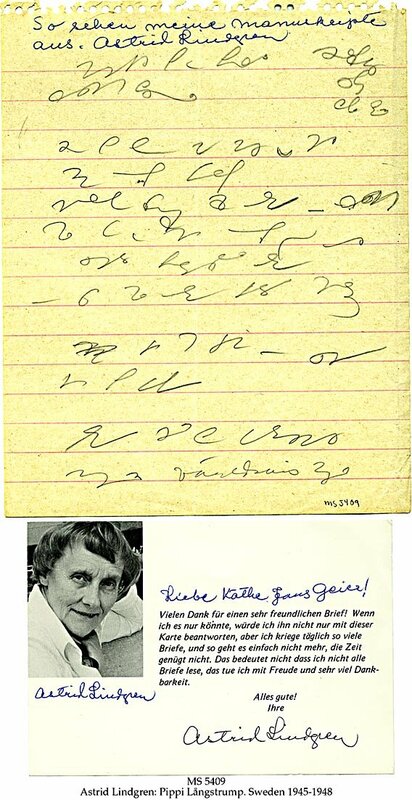 She wrote her MSS in a rather unreadable shorthand and the present MS page is believed to be from one of her Pippi Longstocking books, which were: Pippi Långstrump (1945), Pippi Longstrump går ombord (1946) and Pippi Långstrump i Söderhavet (1948). Millions of kids know and loves Pippi with her fiery red hair worn in braids. movies and animated films have been made, both for the movie theatre and TV. She is still very much alive for the 3rd generation of kids in Scandinavia and the rest of the world.